When you run the desktop app, a small amount of configuration is required : enter a port number to listen on (default 4445 is fine), create a password then press the OK button. This information (and another value that was copied to the clipboard when OK was pressed) is used to set up the the mobile app on your device - in the following steps. Why is there a desktop app? 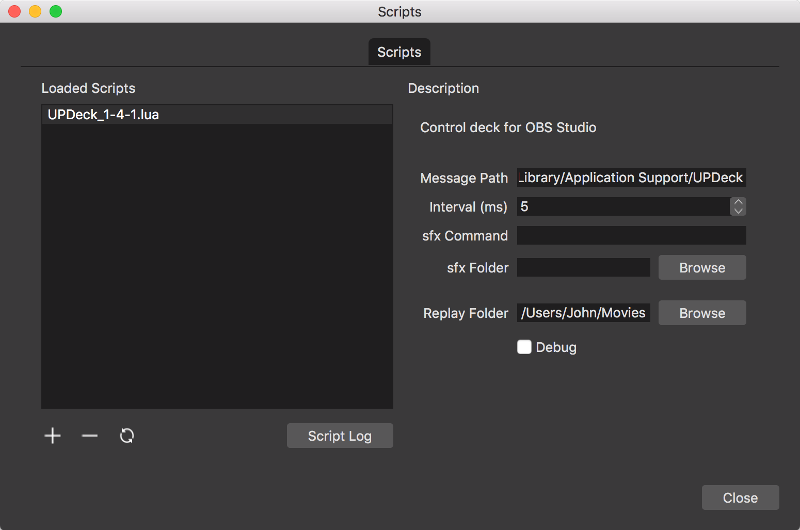 Originally, there was just a Lua script for OBS and the mobile app. Unfortunately, there were problems loading the Lua socket library from OBS scripts, so that part of the code was turned into a small desktop app. The good thing about keeping the OBS script is that you can add code to it very easily and then program the mobile app buttons to use the new functionality - nothing has to be recompiled. A timeout field has been added. If you leave it at 0, then it does nothing. It will also accept a value of 10 or more : this is the number of seconds that must pass before the desktop app resets itself - if it has not received a message from the mobile app. This means that if the desktop app doesn't detect a dead connection, it will reset automatically, without you having to manually press the reset button. 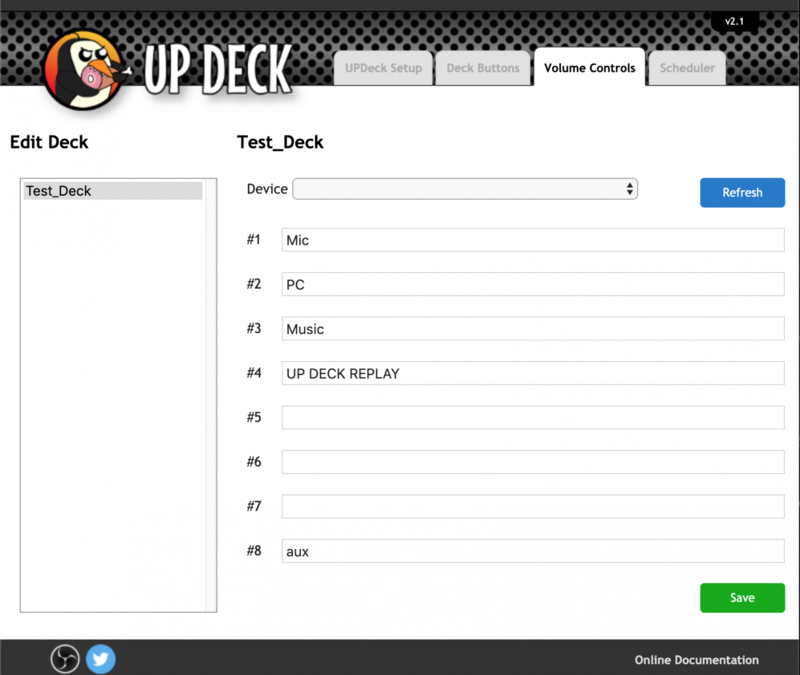 Backup your deck on the device or on desktop. 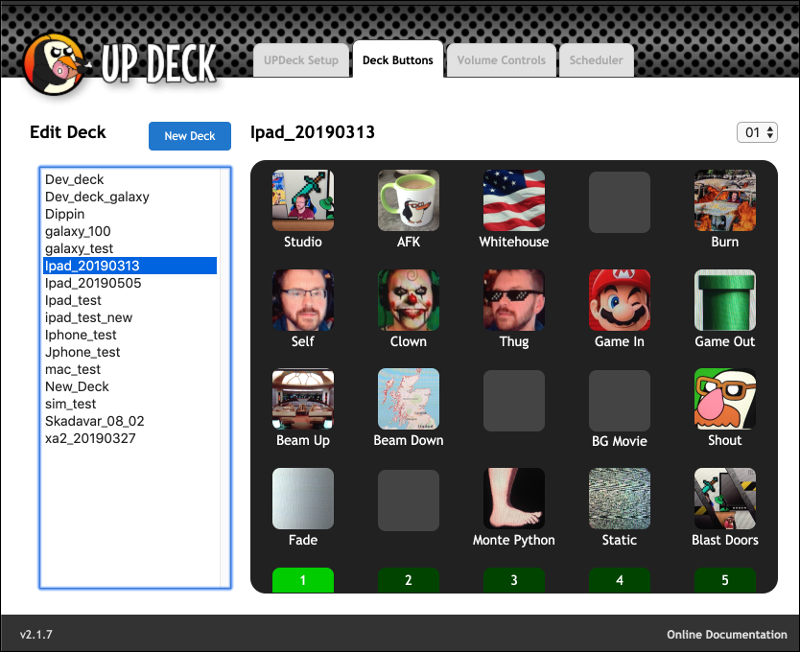 Device backups allow switching of multiple decks easily and desktop backups allow you to share decks between devices. Deck buttons can be triggered with OBS hotkeys. V1.3 can send keystrokes to OBS and other applications. 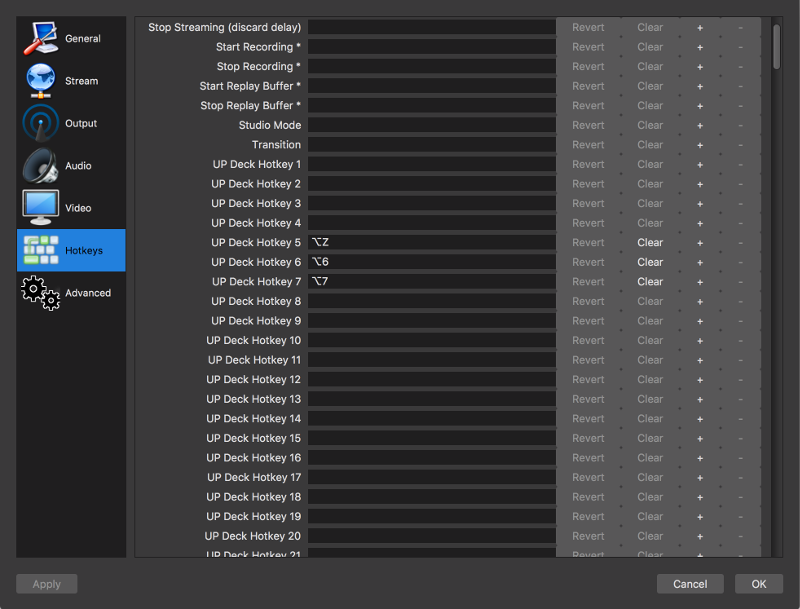 Trigger OBS hotkeys and control other applications while you stream. 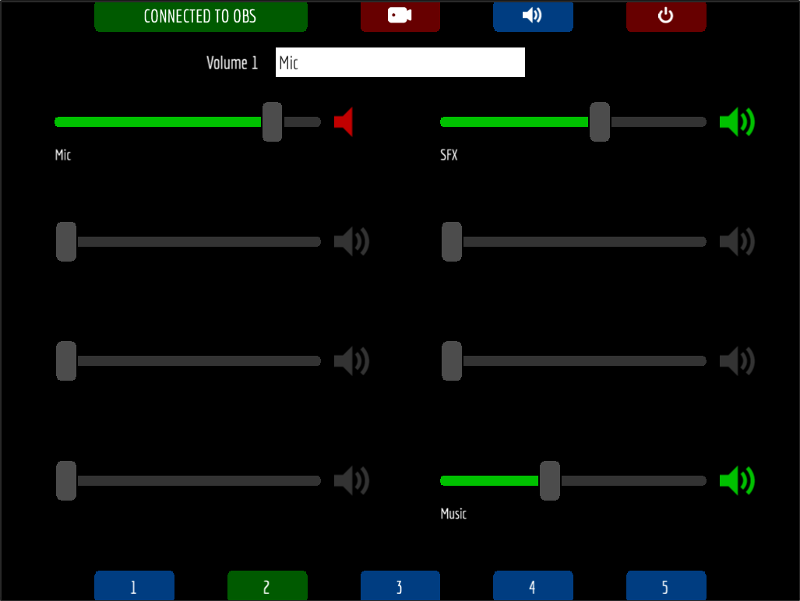 V1.2 has a new option to handle playing sound effects - instead of passing sound effect commands to OBS, the app will handle them, but pass all other commands through as normal. If you use this option then simply drag the folder containing your sound effects on to the app (shown below). The next screen is the main interface and it's from here that you connect to OBS. The button at the top left of the screen shows the current status - OFFLINE. When you tap this button, it turns amber as the app attempts to connect and then green, showing a connected status. If connection fails, double check the host address is correct, and that the port number and password match those set up in the desktop app. The red button at the top right returns you to the previous screen. The deck has 5 banks of 20 buttons. The screen can be swiped left and right or you can use the buttons at the bottom of the screen to quickly jump to another bank. 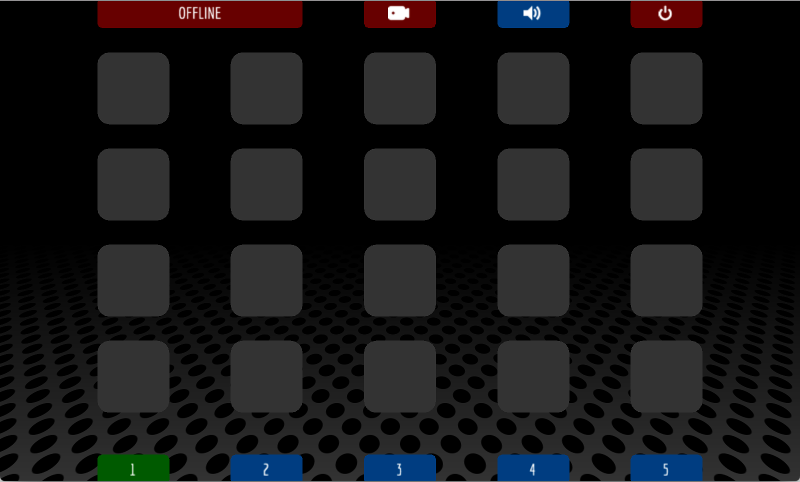 The second button at the top of the screen shows and hides the control panel to control streaming and recording. 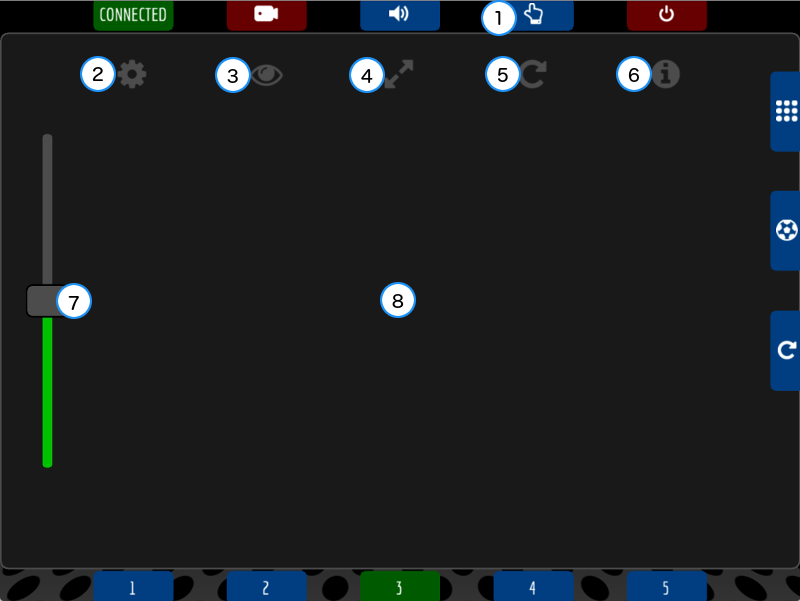 The blue button at the top of the screen shows and hides the panel to control volume and muting. To configure a volume control, press and hold its mute icon until a text box appears at the top of the screen. Type the name of the audio source into the box - exactly as it appears in OBS (case sensitive). Once complete, sliding the volume control up and down should change that audio source's volume in OBS. When setting up button actions, the app goes OFFLINE, so remember to reconnect again when finished by pressing the top left button on the main screen. 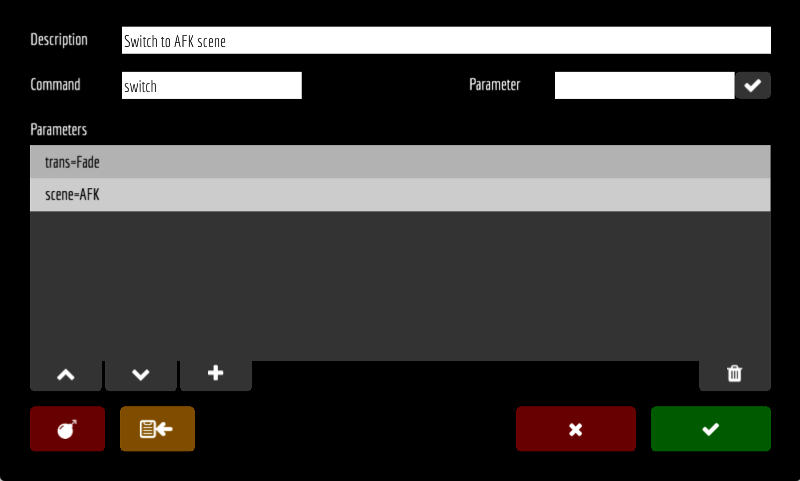 As an example, we will program a button to switch to a scene named 'AFK' using the 'Fade' transition. 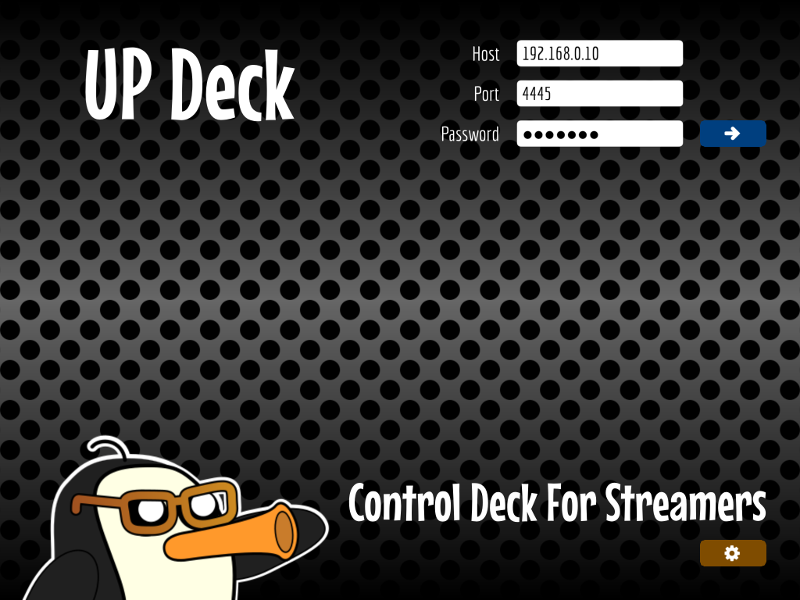 Pick any deck button then press and hold until the button setup screen appears. 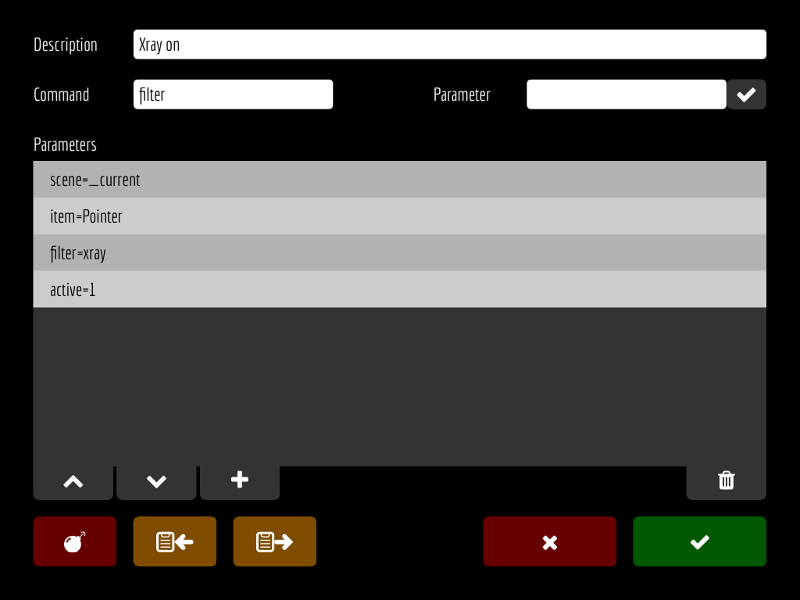 Enter the button label - this will be displayed under the button on the main screen. If you enter a button group then this button will become a member of that group. When a grouped button is pressed, it is hilited with the color selected. Only one button in a group can show it's hilite color, so you can always tell which button in the group was pressed last. You can add multiple commands (actions) to a button - the list below is empty, so click the '+' button at the bottom of the list to add a command using the command setup screen. Enter a description for our new command in the text field provided and enter 'switch' in the command field. We can define the transition to use and the scene to switch to by using named parameters. 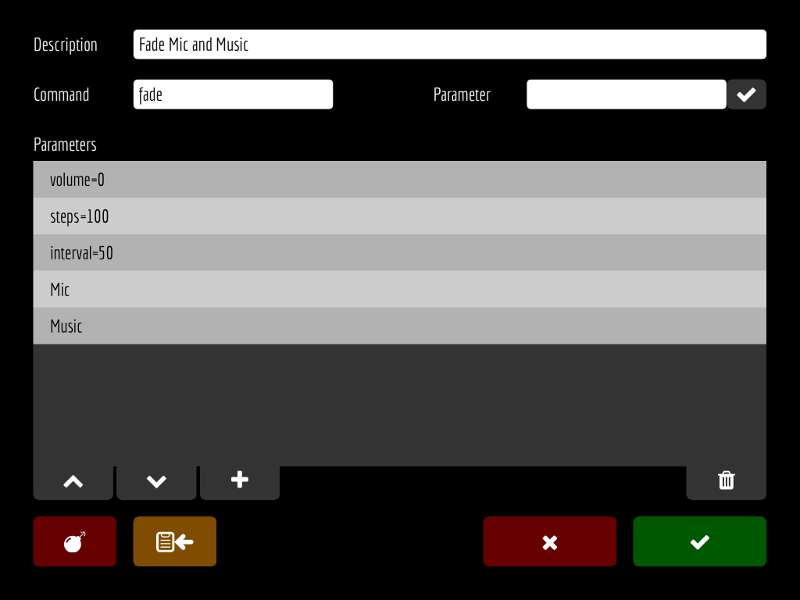 Type 'trans=Fade' into the parameter field and then press the tick button next to it. Type 'scene=AFK' into the parameter field and then press the tick button again. To save our changes, we need to press the green save button on this screen and then press the save button on the button setup screen. This takes us back to the deck. Remember to connect to OBS again before testing your new button functionality. 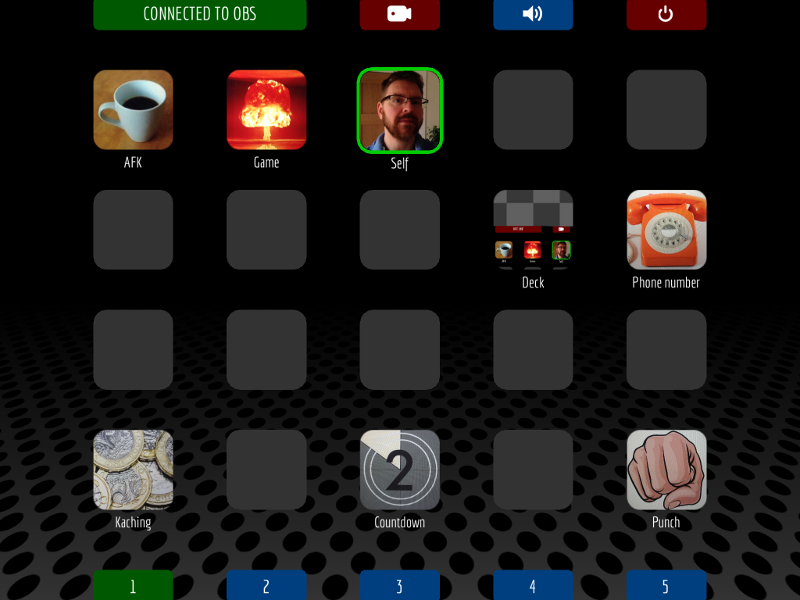 Pick a deck button then press and hold until the button setup screen appears. Tap the blank icon image (or the existing icon if you are changing it) at the right side of the screen and the icon setup screen will appear. The amber buttons at the bottom of the screen allow you to take a picture with the device camera, select an image from the photo library or clear the image you are currently working with. Once you have an image on screen, you can pinch zoom and rotate it until the icon viewfinder contains the image section to use on the button. Another easy way to source images for creating icons is to search the web on your PC, find an image you like, then take a picture of the PC screen. Press the green save button to assign the icon to the button. When the group field is populated in the button setup screen (see assigning actions to buttons), the button becomes a member of that group. In the example below, the three buttons on the top row are members of the 'scenes' group. When one of these buttons is pressed, it is hilited in its selected hilite color. If either of the other buttons was previously hilited, it returns to its normal state. Only one button in a group can show it's hilite color, so you can tell which button in the group was pressed last. Creating toggle buttons - on/off, show/hide, etc. You can create toggle buttons to give on/off functionality by using the special group * (asterisk) when configuring the button. Once set, the button has two states and pressing it toggles between them. To configure each state, simply press the button until it is in the state you wish to configure, then press and hold until the button setup screen appears. Each state has it's own unique configuration, including hilite color and icon. Familiarize yourself with adding actions to buttons. The transition parameter is optional - if omitted, the current transition is used. The scene parameter is case sensistive, so must be exactly as it appears in OBS. 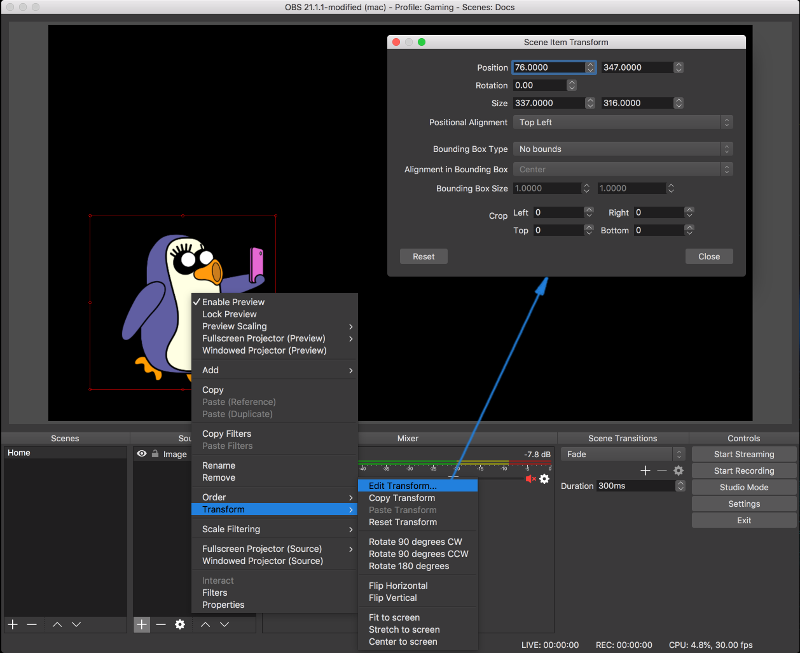 The group parameter must be used if the scene item is in a group (available from OBS Studio v22). If you are going to resize items in your scene, then it's important to set a bounding box type for those items. UP Deck sets the size of the bounding box when you change the width and height of an item. right click on the item in the scene view to show the context menu. select Transform -> Edit Transform... from the menu. The following doc has a video attached with an example : animating a camera object - step by step. If you are setting the opacity of any objects then you must create a special object called UP DECK. It can be any type of object - an image for example. It can also be created in any scene - as long as it exists somewhere in OBS - it can even be invisible. You then must add a Color Correction filter to this special object : rename the filter to UP DECK COLOR. After this special object and filter have been created, you can set the opacity of any object in any scene. right click on the item in the sources list (or in the scene view) to show the context menu. select Filters from the menu. click the + button at the bottom left of the Effect Filters list. The scene and item parameters are case sensistive, so must be typed exactly as they appear in OBS. The four crop parameters (cl, cr, ct, cb) allow you to crop the scene item from the left, right, top and bottom. Setting Opacity : If you are setting the opacity of any objects then you must create a special object called UP DECK. It can be any type of object - an image for example. It can also be created in any scene - as long as it exists somewhere in OBS - it can even be invisible. You then must add a Color Correction filter to this special object : rename the filter to UP DECK COLOR. After this special object and filter have been created, you can set the opacity of any object in any scene. x and y position : the top left corner of the screen is 0,0. If you're broadcasting in 720p then the bottom right of the screen is 1279,719 (screen size of 1280x720). If you only want to resize an object, you can supply the w and h parameters and omit the x, y and r parameters. (And use the resize alias to make things easier to understand). The same is true for positioning and rotating. If you only want to move an object, you can omit the w, h and r parameters - the same is true if you only want to resize or scale : just leave out the parameters you don't want to change. By adjusting the steps and interval values, you can control the speed of the animation and how smooth it looks - experiment to find your preferred values. The optional easing parameter adds an easing effect to the animation. Valid values are EaseOut, EaseIn, EaseOutIn, EaseInOut and EaseOutElastic. If no easing is specified (or an invalid value is used) then no easing is applied. As an example, take a look at the two screenshots below : one moves an object on to the screen and the other moves it off screen. When moving the object on to the screen, EaseOut has been used so that the object starts quickly, then decelerates as it reaches the target position. When moving the object off screen, EaseIn has been applied to start the animation slowly and then accelerate off screen. This is an extension to Animating_objects : moving_resizing_rotating, so check out that page first! From version 2.0.3 of the Lua script, filters properties can be animated, which opens up some new and interesting possibilites. 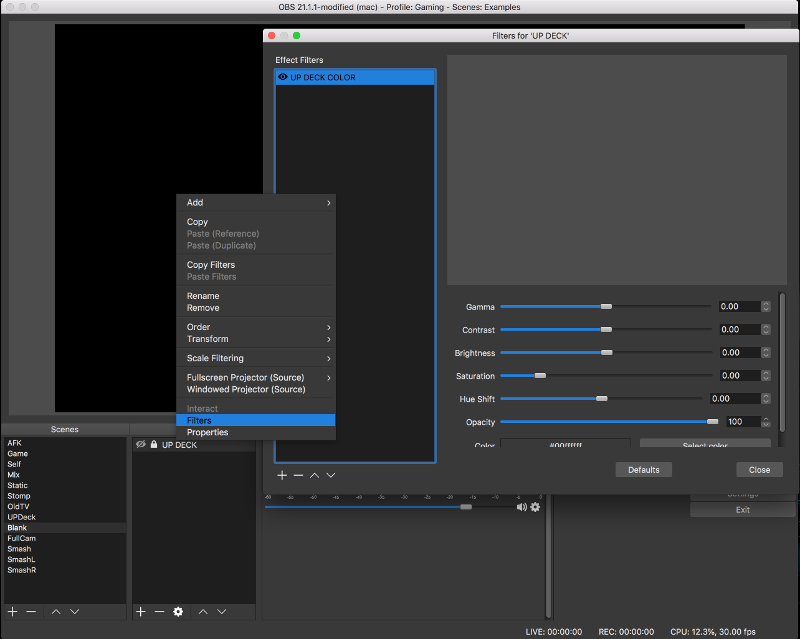 The video example uses the excellent stream effects plugin. All the usual variable substitution and relative value options should work as normal. Note the use of the colons to separate each part of the filter property data. I used the same command to restore the TV by setting Filter.Transform.Rotation.Y back to 0 and Filter.Transform.Scale.X back to 100. All of the above can also be used with the position command to directly set filter properties without any animation. If you've been using the position or animate commands to manipulate objects on screen, then things just got even easier! This will morph the object that you are manipulating to the position, size, rotation and cropping of the morph object (which can be on another scene). You can create template objects in OBS and then use them to guide your camera, etc. around the screen. 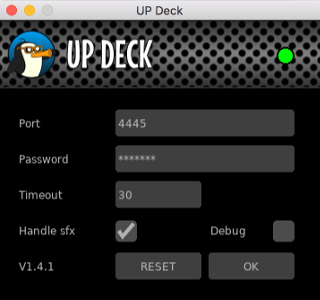 Easy to set up, easy to edit and easy to program in the deck! * Remember to set the bounding box type of template objects that you are going to use with morph! From version 1.8 of the OBS Lua script, you can now use relative values for the x and y co-ordinates, width and height, and rotation of objects using the position and animate commands. places the object at 100 pixels from the left edge of the screen and 300 pixels down from the top. places the object 50 pixels to the right and 80 pixels up from its current position. places the object 100 pixels to the left of its current position and 250 pixels down from the top of the screen. For width, height and rotation, just specify the w, h and r values in the same way as above. Note : if the queue is inactive and an animation is in progress, activating the queue will cancel the existing animation. * If the scene item is in a group then this command only alters the layering of the objects inside the group. Example: Game video full screen and camera in bottom corner. If you switch these items - expand the camera to full screen and shrink the game video to bottom corner, then the camera will completely cover the screen and you won't be able to see the game video as it's still behind the camera view. In this case, we can switch the order of the scene items (like layers in the Gimp or Photoshop). At some point, as the camera is expanding from the bottom corner, we switch it's layer position so that it appears behind the game view. When the transition is complete, the game view is now sitting in front of the camera, so is visible. If we switch back again, we do the same thing : which ever view expands to be full screen must be moved behind the other view. In my setup, I had a background image which appeared behind both camera and game - this background image is layer 0. The view to be expanded to full screen is set to layer 1 - which puts it behind everything else, apart from the background image. The example below waits until the transition is in progress, then switches the OldTV scene item to layer 1. You can stop and start external processes - an example is Pretzel for playing background music. This can free up CPU time while the process isn't being used rather than just mute it's audio. These commands operate on already running processes - so Pretzel should be started manually. The optional delay parameter is also available for these two commands - it specifies a time (in milliseconds) to wait before running the command. The example below stops Pretzel after a 2 second delay. The optional delay parameter is also available - it specifies a time (in milliseconds) to wait before running the command. 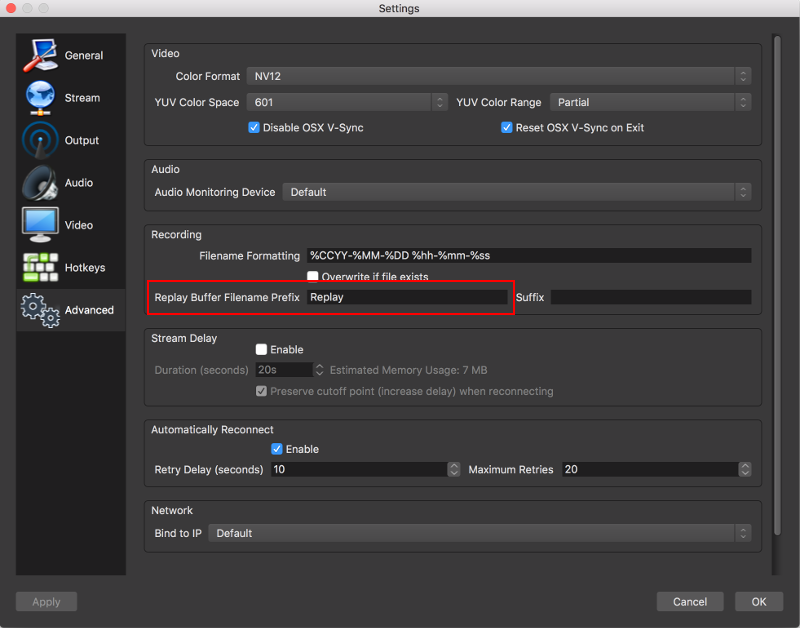 If you use this option then simply drag the folder containing your sound effects on to the desktop app (shown below). This will import the sound effects and make them available to play. The example below fades the volume of the Mic and Music audio sources from their current levels to 0. The fade effect is split into 100 steps with a 50ms interval between each step. 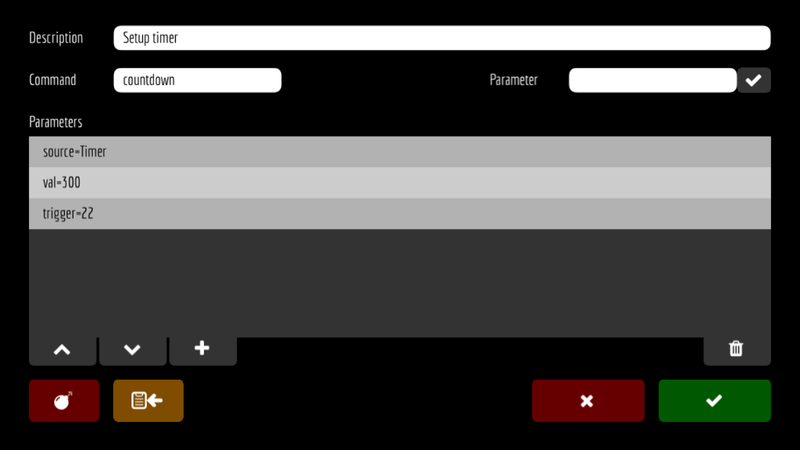 The val parameter can be 0 (unmute), 1 (mute) or * (toggle current setting). 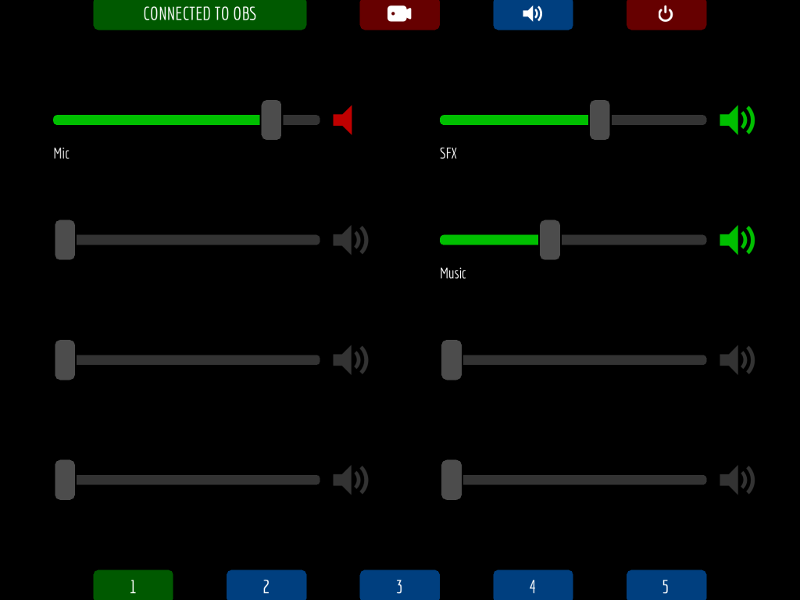 Starting and stopping your stream (or recording) is done by pressing the buttons in the stream panel - accessed using the second button at the very top of the screen. If streaming or recording is live then the buttons change to green. 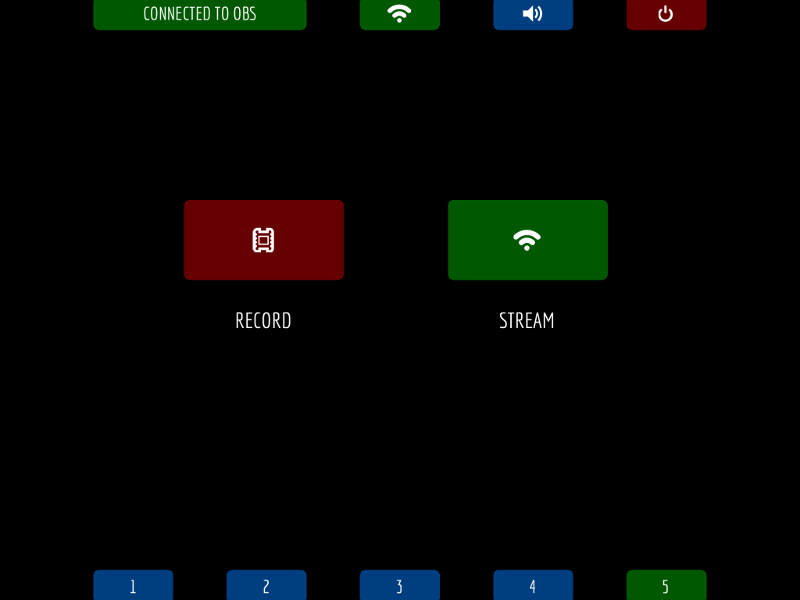 The panel button at the top of the screen also changes color and displays relevant icons so that you can see the current state back on the deck screen. The app parameter is used to find a window with a match in its title bar. The example below sends an F11 key stroke to Winamp on Windows. The data parameter is different for each platform! RETURN, TAB, SPACE, DELETE, ESCAPE, VOLUMEUP, VOLUMEDOWN, MUTE, HELP, HOME, PAGEUP, FORWARDDELETE, END, PAGEDOWN, LEFT, RIGHT, DOWN, UP, F1, F2, F3, etc. If there are modifier keys, then add a + (plus sign) before the final key code. There were a couple of requests specifically for animating the camera, so the attached video shows how to set it up step by step. Look out for the information on setting a scene item's bounding box type - it was missing from the docs and UP Deck requires this data to be set before it can resize an object! The video contains everything you need to know to animate objects by changing their position, size and rotation, so you can apply the techniques to any of your own scene items. Adding to the previous video, another item is added to the scene and we switch the position and size of the two objects with an animated transition. You can use this idea to switch your camera and game video between full screen and minimized. If you add a text source to your scene, you can use UP Deck to initialise it with a number, then use it as a counter or score board. The example below updates a text source named Score1 - it adds 1 to the current value and displays it as a two digit number. To create a countdown timer, add a text source to your scene. The example below creates a timer and counts down from 5 minutes (300 seconds). Deck button 22 is triggered when the coutdown completes. The example below updates a text source named MsgBoxText. The example below updates an image source named PlayerImage. If you want to reference whatever the current scene is in OBS then you can use the special scene name _current instead of the actual scene name. 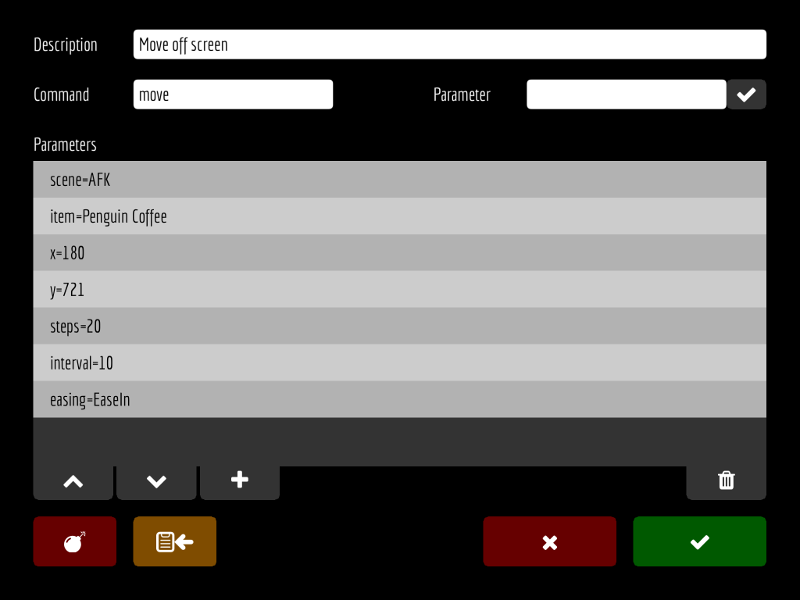 The scene, item and filter parameters are case sensistive, so must be typed exactly as they appear in OBS. Dragpad gives you the ability to move objects around while you stream / record - as an example, you could have a pointer image to show viewers the exact location of the subject you are talking about. Show or hide the dragpad panel. Displays a list of items in the current scene - select one to manipulate. If the selected item is off screen, this button will move it back into view. Activate / de-activate resizing : use a two finger pinch zoom gesture to resize the selected object. Activate / de-activate rotation : rotate two fingers on screen to rotate the selected object. Shows position information on the selected object. 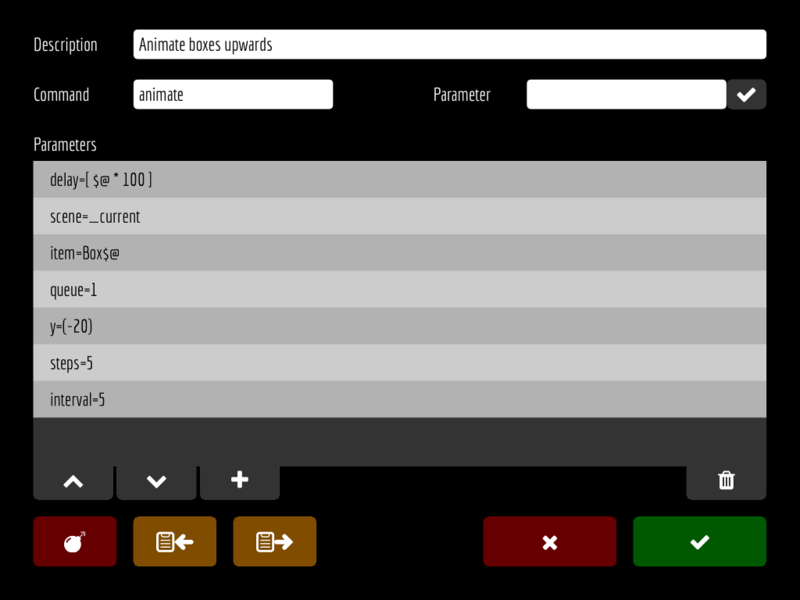 Drag speed : control how quickly the object is moved on screen. Move your finger (or fingers) around on the main area to manipulate the selected object. 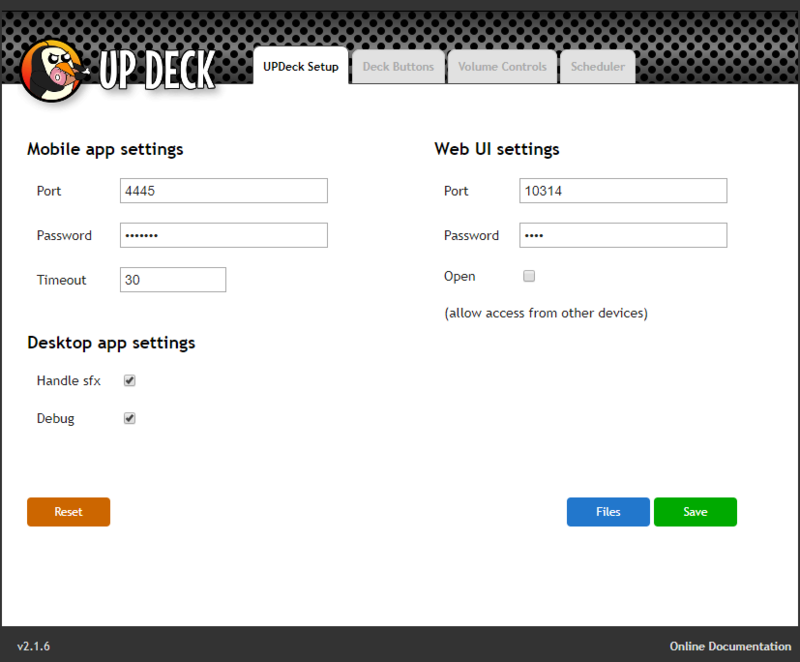 UP Deck lets you backup and restore decks to your device and desktop. The numbered guide below shows the backup panel layout and explains the controls. If you have put a lot of effort into a large deck, it's best to backup to the device first, before wiping / starting a new deck. Show / hide the backup and restore panel. Enter the name of the backup to create. 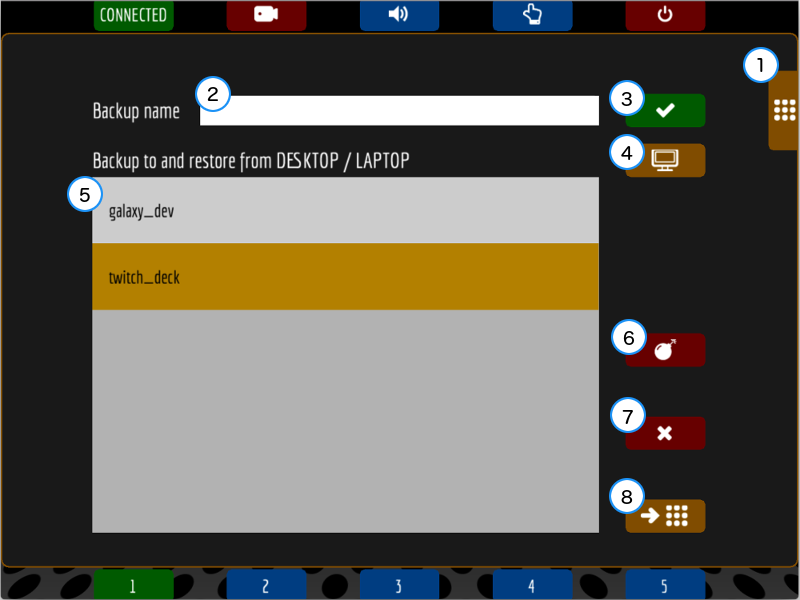 Backup the current deck either to the device or to the desktop (selected by button 4). Select device or desktop as the target for backup and restore. List of current backups on selected target. Wipe the current deck - all buttons and icons are deleted! Delete the selected backup from the list of backups. Restore the selected backup to the deck - overwrites current deck! You can now use OBS hotkeys to trigger the deck buttons. In OBS => Settings => Hotkeys, there are entries for the 100 deck buttons. Once defined, triggering a hotkey will simulate pressing the button on the deck. The only feature not supported at the moment is the toggle button feature : only the button's first state can be triggered, but I'll have a look at adding this extra function for a future update. Port : defines the port number that the desktop app will listen on for messages from the mobile app. If you're not sure about ports or if you have no reason to change it, then the default value of 4445 should be fine. Password : enter a password - required to log in from the mobile app. The desktop app only allows one connection at a time, so once you're connected, you don't have to worry about anyone else hijacking the session. Timeout : in some circumstances, it's possible for the mobile app to be disconnected, but the desktop app fails to detect the dead connection. The timeout field will accept a value of 10 or more : the number of seconds to wait before resetting the connection if nothing has been received from the mobile app. If you leave the timeout at 0 then it is de-activated and does nothing. Handle sfx : when this option is activated, the desktop app intercepts commands to play sound effects, instead of passing them on to the OBS Lua script. Playing sounds this way is faster - there is some small, but noticible lag when playing sounds via the longer route. Debug : when UP Deck is run from the command line on Linux or Mac (using the love executable and passing the .love file as a parameter), this option outputs debug information to the terminal window. RESET : press this button to reset the connection - if you ever have to! OK : press to save the current settings on screen. When pressed, a value is copied to the clipboard - the message path, which is used when setting up the OBS Lua script. Set up the Replay Buffer - I'm recording 10 second clips. 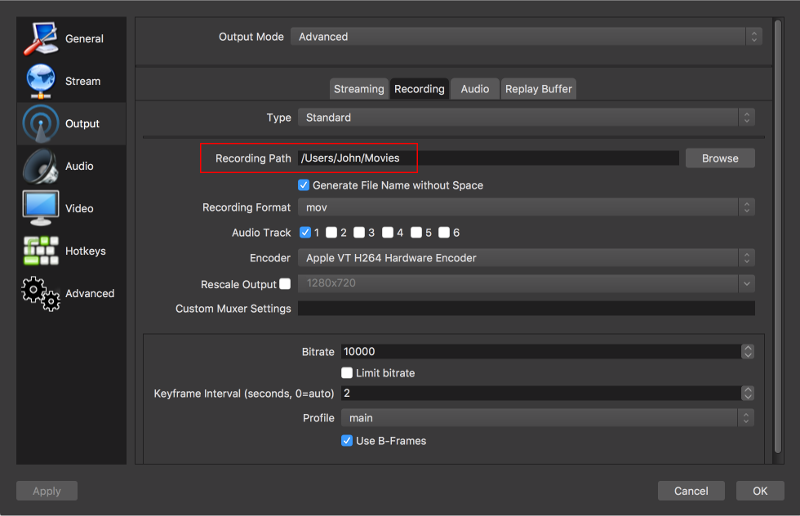 Take a note of the Recording Path setting in the Recording tab for step 4. Set up the Replay Folder in the Lua script : the Recording Path setting from step 2. Start the Replay Buffer. There's a new button in the streaming / recording panel to start and stop the replay buffer. Use the Replay Save Panel to save action replays (button with a soccer ball icon). While playing a game, you won't get distracted looking for a small button to press - press anywhere on screen to take an action replay. 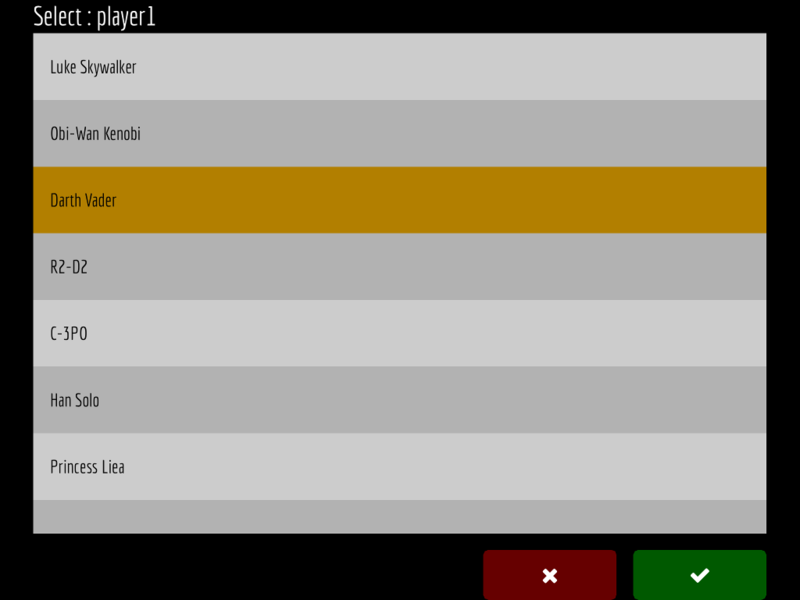 Create a media source called UP DECK REPLAY in the scene where you want to show your replays. 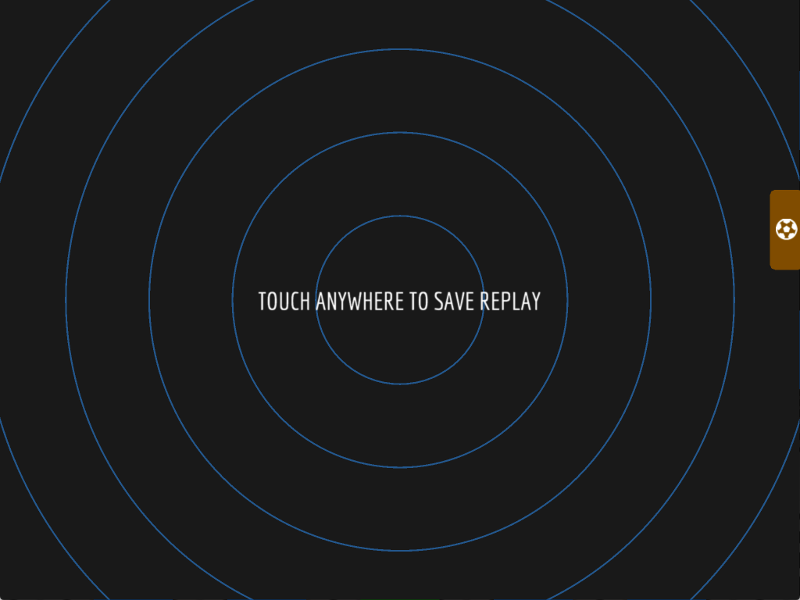 You can then use the Action Replay Panel to view the saved replays. Show / Hide the action replay panel. Select action replay speed (unfortunately, does not change the replay speed while playing). Current prefix : files are selected that begin with the prefix. Search for files : changes the prefix used to select a group of files. Take an action replay now! (The replay buffer must be active). List of available replays to select. Wipe replays - all replay files are deleted. Custom button : an extra deck button for custom actions in the replay panel. Stop replay. (You can configure commands to run before the replay stops with a long press). Play the selected action replay. (You can configure commands to run before the replay starts with a long press). I would love it if the speed control worked real time while a replay is playing, but it just sets the speed for future replays. Buttons 11 & 12 - run commands before playing / stopping - why?? Hide the replay object (UP DECK REPLAY). Show the replay object after a 500ms delay. This solved the problem of the previous clip appearing for a short time. Long press (press and hold) the green play button (button 12 in the screenshot above). This will take you to the button set up for custom actions before a replay starts. You can see I have two actions - one to hide the replay object, then one to show it again after a pause. The first action simply hides the UP DECK REPLAY object (so you won't see any glitchy frame from the previous clip). The second action just shows the object again after a 500 millisecond delay - by this time, the new clip has been loaded. Although the replay panel gives you easy access to replays, or files with any prefix you search for, you may want to program deck buttons manually. A list is created of the files with names beginning with the selected prefix (in alphabetical order). Each file can be referenced by its index number, beginning with 1. The save action does not need an index number, it just captures a replay - as long as the replay buffer is active. The play and delete actions operate on the file selected by the index number. The wipe action deletes all of the currently selected files! When playing multiple movie files using the replay panel, you may notice the previous movie flashing on screen briefly before the selected file starts to play. 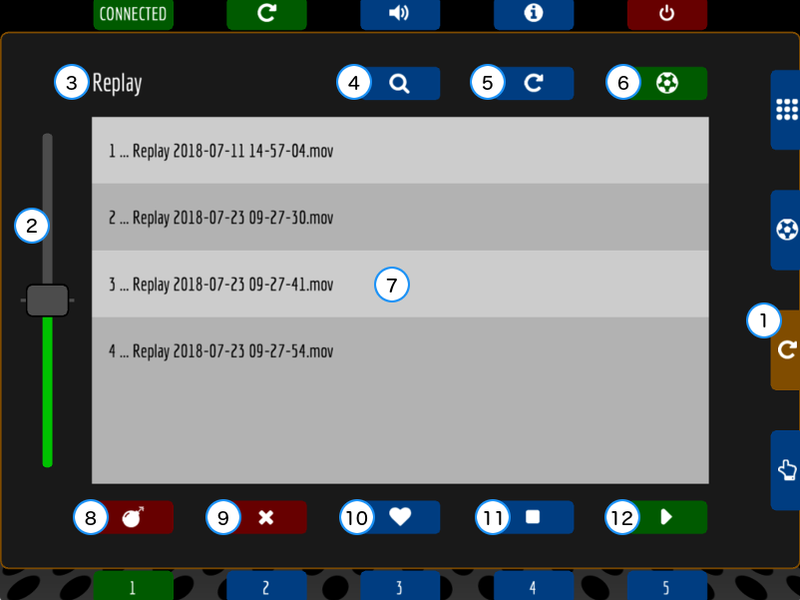 Some extra deck buttons have been added to help solve this problem : the play, stop and custom (heart icon) buttons in the replay panel are configurable by a long press (press and hold). 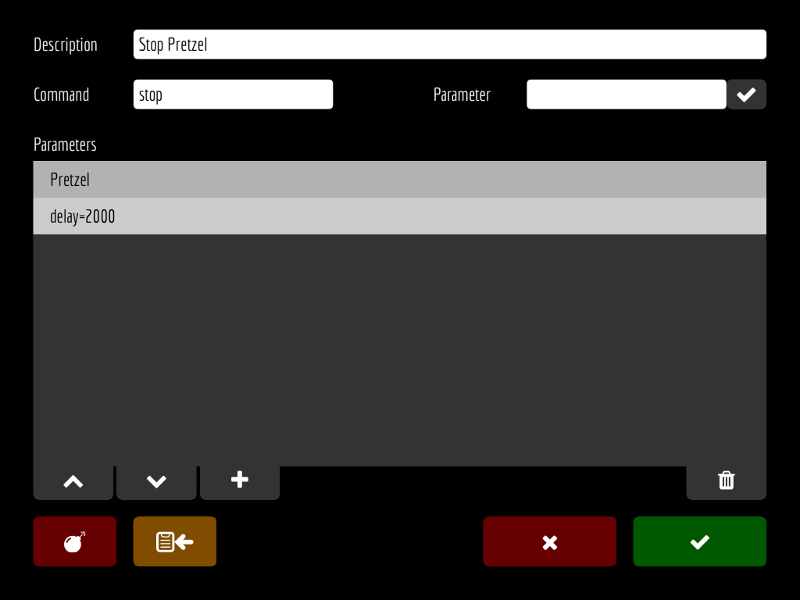 Any actions programmed in the play and stop buttons are performed BEFORE the main button function. As an example, you can program the play button to hide the replay object and then show it after a short delay : this solves the problem of the previous video flash on screen. Up to now, you should have been using a media source as the replay object (UP DECK REPLAY). You can also use a VLC source. During testing, the VLC source audio went out of sync when playing a movie file, then selecting another file to play before the current file had finished. The media source audio always stayed in sync. However, the media source only lets you play one file at a time. If you want to play ALL of the current files as a playlist, then you may want to consider using the VLC source. This will play all the current files in sequence if you are using a VLC source. the speed control only works for media sources (not VLC) and controls the playback speed for the next files selected. 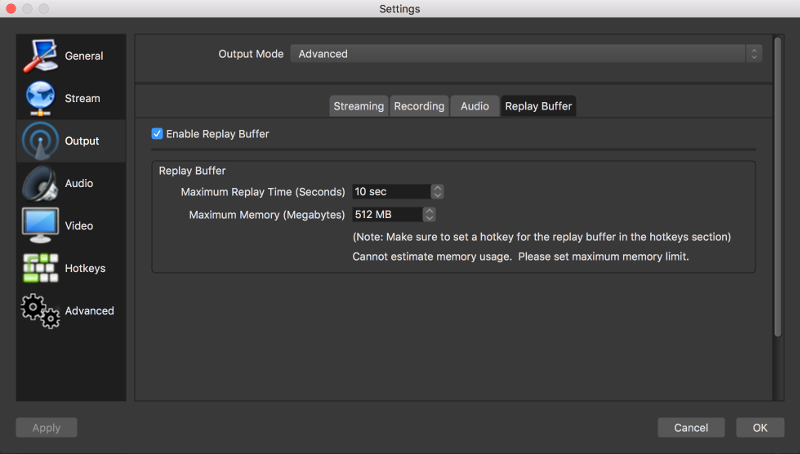 the STOP button in the replay panel does not work with VLC sources. The example below presses deck button 20 after a 1 second delay. Each input name should be lowercase, begin with a letter and contain letters, numbers and the underscore character. Each input type is either "text" or "number"
Every time a *list parameter is ecountered, UP Deck will attempt to load the specified list from a text file and store it in the deck. If the file can't be loaded, the previously loaded version will be used if it exists. This allows you to load a file from one PC and then continue to use it when connected to other machines that don't have a copy. UP Deck looks for a 'StarWars.txt' file in the lists folder. If you click the 'FILES' button on the desktop app, the application's folder is opened on the desktop. There should be a folder inside named 'Lists' - this is where you should save your text files. You can also create lists with values and labels : you pick from the list of option labels and the value for that option is returned. To set this up, create a list like the one below. Every line that has a value and a label should begin with a ':' (colon). The value comes after the colon, then another colon followed by the label. Using the list above, selecting 'R2-D2' would return the value '4'. Values don't have to be numeric, they just can't contain a colon character. Only the labels are shown in the deck when selecting - the values are hidden. Each variable name should be lowercase, begin with a letter and contain letters, numbers and the underscore character. A special loop counter variable is created ( $@ ) which you can use in your commands. The following ipad screenshots show the commands used for a wave effect. There are five boxes (color sources) at the bottom of the screen (Box1 ... Box5). The boxes are side by side, filling the width of the screen. To create the wave effect, each box has a slightly longer delay before it starts to move - using the loop couter variable $@ multiplied by 100 (millisecs). Note that the animation queue is enabled for each object so that any animation performed on it is finished before another begins. Also note the brackets around the change to the y position : indicating that the change is relative to its current position. Since the animation queues are enabled, we can simply animate the box back to its original position - this animation will trigger when the previous animation is complete. When used with loops, this functionality allows you to create some more complex animations without having to write a lot of individual button commands. There were quite a few requests for drawing on screen during a live stream, so here's the first working version. Be warned - it's not fantastic - but hopefully it's useful! The original idea was to try to grab the current OBS view, get that image on the tablet, draw over the top, then transfer the drawing back across. After a few attempts, the results were too slow to be of any use. The compromise was to re-use the existing drag pad (that allows you to drag objects around the screen). By creating an object on your scene to overlay your content, we can now turn on drawing on the tablet and create some basic lines and shapes over the live stream. Even using this cut down idea, it's still fairly slow creating the updated image and then updating it on OBS. 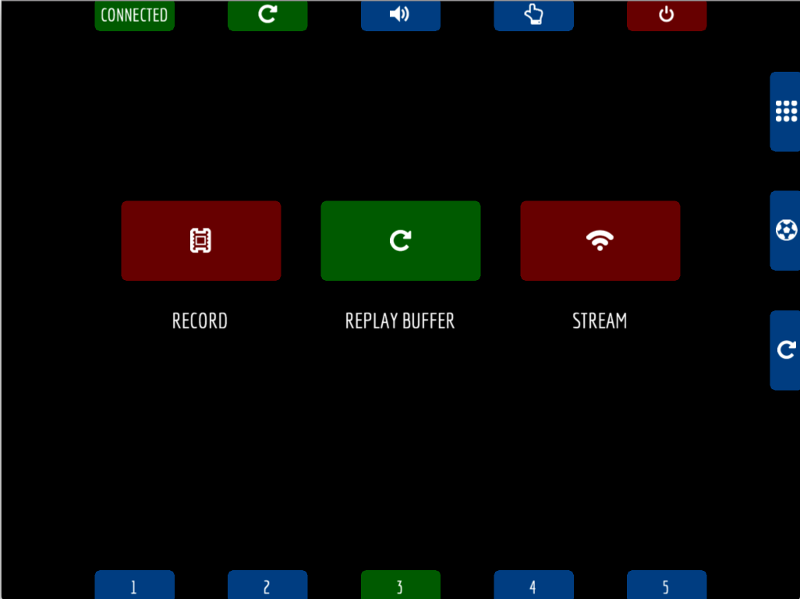 The third config button accessed by pressing the heart icon lets you input the width and height of your stream. 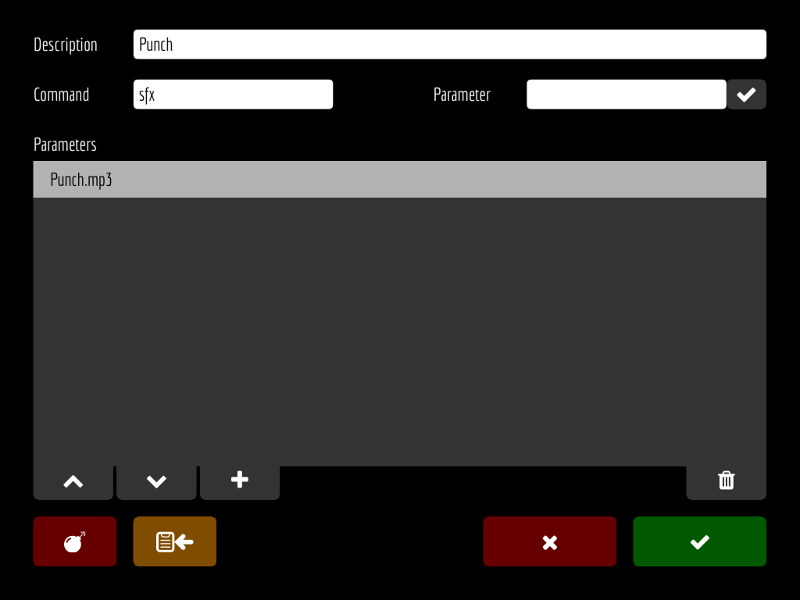 This allows the drawing to match the position of the pointer on screen - the defaults are 1280 x 720. The desktop app is now just a small window with the logo and a red/green light. To access the browser interface, double click the logo and it should open. Create at least one deck backup on your PC to get started - the new UI edits deck backup files and can also update connected devices by sending the edits to them. The mobile app has an extra field for Name / ID which helps you identify which device you are saving to when multiple devices are connected at the same time. 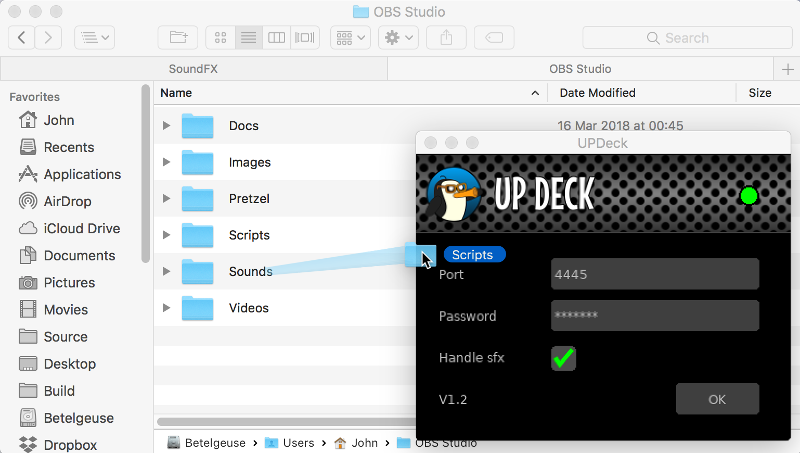 Deck buttons can be edited by selecting a deck from the list of backup files, then clicking the button to edit. 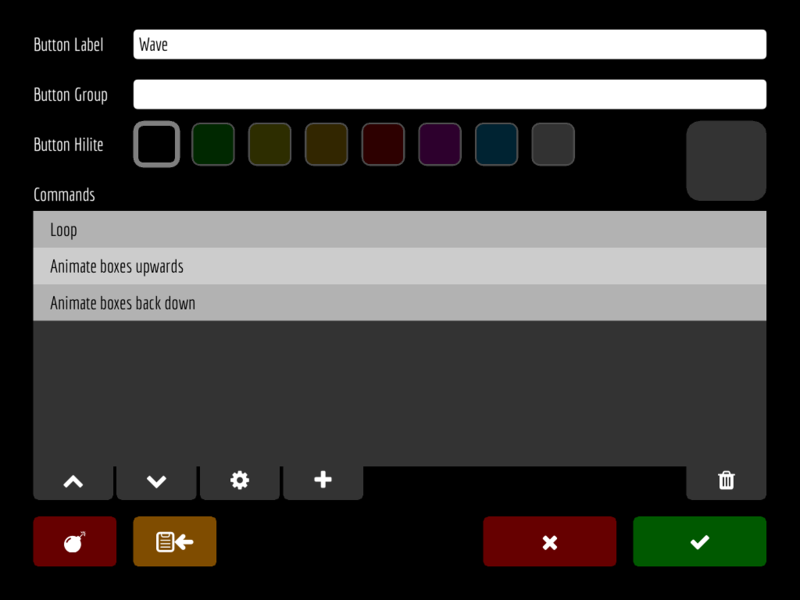 When editing buttons, you can upload, resize and crop icons. Click on the icon to get started. To set up the 8 available slots for controlling volume, just type in the names as they appear in OBS, then save.